Bali province lies in the Eastern part of Java island. This province is included in the Nusa Tenggara archipelago. The archipelago was once called as the Little Sundanese. The Balinese people inhabit Bali Island which is now a province with eight districts and one city. The Balinese live in a neighborhood called Pawongan, Pawongan itself is divided into two types which is customary village (desa adat) and the official village (desa dinas). The principle of Balinese kinship is based on the patrilineal principle which is greatly influenced by the patrilineal family form called dadia. Balinese society is divided into classes based on system and social hierarchy called wangsa (kasta). The Balinese language is included as one of the regional or local languages in Indonesia. This language was the heritage of ancient time, the ancient inscriptions show the existence of an ancient Balinese language different from the present Balinese language. The ancient Balinese language contains many Sanskrit languages, also influenced by the ancient Javanese language from the time of Majapahit. Nowadays, the Balinese language is learned by the foreigners as well because Bali gets so many visitors from outside the country. Triangga is a Balinese social culture especially in the architecture matter, the concept of this architect consists of upstream, body, and legs. Triangga is seen as a miniature of the universe that becomes a place of all human activities. This building symbolizes the force that comes from eight directions of time arrangement called astawara. 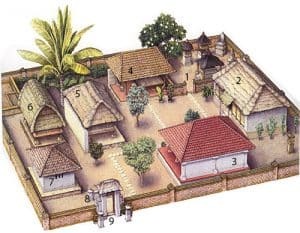 Balinese people have a precise consideration when they want to build home, they believe that the direction where the home is facing to has a meaning. The house that faces the mountain is considered as a direction to virtual nature, sea means the realm of hell, west refers to death or crime and east refers to birth and goodness. Balinese has a good sense of style especially in terms of traditional clothes. Balinese traditional clothing has a variety of types range from daily clothes into ceremonial attire. In the daily life, Balinese boys are required to wear a headdress called Destar or Udeng while girls wear tengkuluk or kancrik. A priest is obliged to wear an attire called Wastra or a White or Yellow. Some of the Balinese wear flowers on their hair or on the earlobes called sumpang. Art is something crucial for the Balinese religious life. Religious ceremonies use various elements of art such as art, music, dance, and literary arts as sacred art. 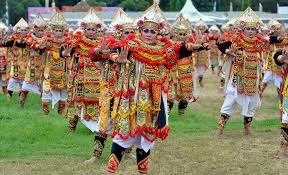 Therefore there are many traditional dances in Bali such as tari topeng which is based on the legend of life with wayang kulit as one of the traditional media. Another traditional dance such as tari baris which is a traditional war dance that worships the mighty warrior of Bali who wins war. The dancers wore gigantic masks or creepy masks by taking stories from the legends of Ramayana and Mahabharata. Some of the Balinese traditional dances are even popular in the international world such as tari pendet, tari barong, or tari kecak. Bali has traditional musical instruments such as rindik, kendang, cengceng, flute, and gender. 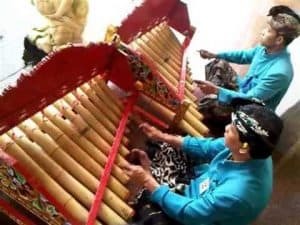 Rindik is one of the musical instruments made of bamboo with selendro tones. This instrument is used in marriage ceremonies and show events known as “Joget Bumbung”. Joget Bumbung dance is usually accompanied by ten or twenty gamelan players. Kendang is an important musical instrument in Balinese gamelan. In Bali there are two types of kendang, namely kendang wadon and kendang lanang. Gender is the most traditional instrument in Bali that is usually played by four persons to accompany wayang kulit. 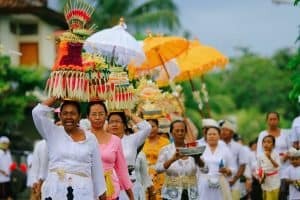 Almost all parts of Balinese life are colored with various traditional ceremonies, so it can be said that the spiritual life of Balinese people is not separated with various ritual ceremonies. The example such as birth ceremony which is divided into three classes namely the common folk, the nobility, and the Bali Aga. Wedding ceremony which is divided into two parts namely kawin lari and kawin ngindih. 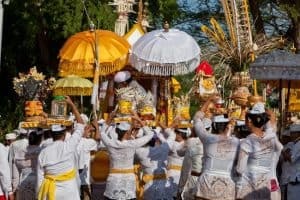 As for funeral ceremony, Bali is well known with ngaben ritual which requires a huge amount of money. Bali province is considered as a region which is rich in culture. One of them is the various handicrafts produced by each district in Bali province. 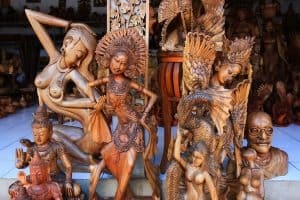 Denpasar is well known for its Wood sculpture, silver handicraft, garment craft, coconut shell craft, sandal fan craft and wicker craft. Meanwhile Bangli district has high potential in producing Bamboo handicrafts, wooden crafts (Tembuku village, Yangkapi, Abangsongan, Suter, Banua, etc), Gold, silver and brass handicraft (Undisan, Peninjoan, Apuan, Tenggahan, etc), and Bamboo Handicraft. Keris is a Balinese traditional weapon. In addition to self-defense kris may represent a person in a marriage invitation. 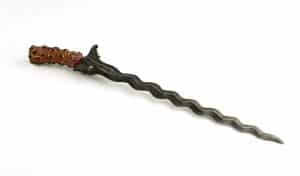 According to the belief of some residents of Bali, keris can heal people who are bitten by venomous animals when drinking water that is soaked in keris. Another weapon is called as wedhung, wedhung is a made of metal forged and wooden handles that have been carved. The third one is tiuk, tiuk is pretty similar with wedhung however tiuk does not use as a weapon for self-protection but tiuk is used to cook or making sesajen. Gecok: One of the discussion that should not be forgotten is Balinese traditional foods. Gecok is one of Balinese authentic foods. This dish is made from fern leaves, meat and coconut milk. Using onion spices, garlic, pepper, sugar, pecan, turmeric, shrimp paste, lime leaves, and a little salt. Other dishes that can be found in Bali, such as Babi guling, Lawar, Ayam Betutu, Bebek betutu, and Sate pentul, Kacang rahayu. Folk Songs: As what have mentioned before, Bali has so many cultures including folk songs. So far there are some popular folk songs that are coming from Bali such as Mejangeran, Macep-cepetan, Ngusak Asik, Putri Ayu, Meyong-Meyong, and Ratu Anom. Gapura Candi Bentar: Balinese traditional house is identical to the temple of Bentar Temple. Bentar Temple gate consists of two temple buildings that have identical shapes and are placed parallel as the main gate to enter the courtyard area of the house or the outermost gate, usually the main entrance of a temple or place of Hindu worship in Bali. Despite Bali is now a modernize region, the social culture still develops well in the region. It is good so that the visitors can know and love the local culture.